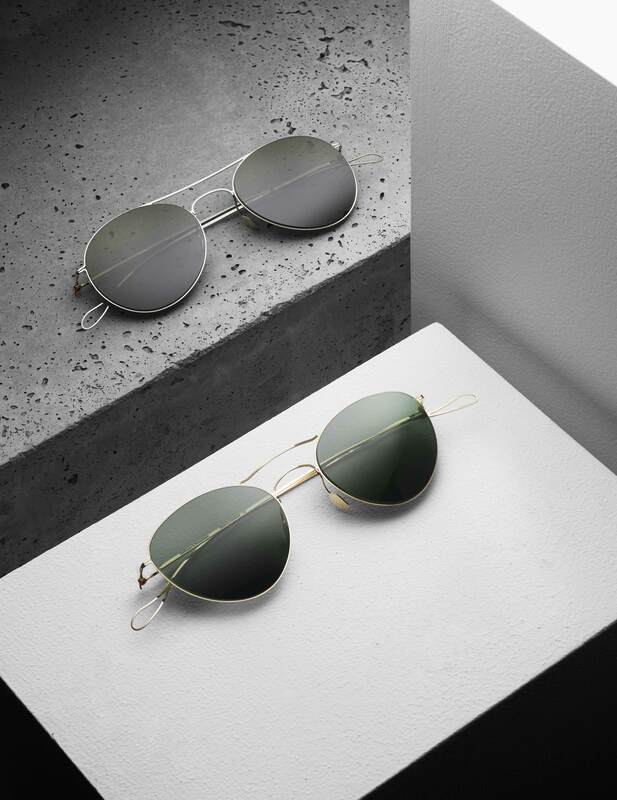 The news spread like wildfire across the industry two years ago: Daniel Haffmans, Philipp Haffmans, and Jean-Pierre Neumeister decided to leave eyewear label Mykita. Industry insiders were surprised. After all, these three were founding members of Mykita and had already created a successful label earlier on with ic! Berlin. After a short reorientation period, the trio decided to stay within the eyewear business and apply their over 20 years of expertise to a new project. With their new eponymous label HAFFMANS & NEUMEISTER (HNH), Daniel, Philipp, and Jean-Pierre are building their third house “just for themselves”. When the first pieces from the new label debuted in front of select audiences last year, it was clear that the three are not aiming to reinvent themselves radically with their new venture, but rather stay the course of their evolutionary path. The main focus lies with a special level of finesse in their products. One year after the launch, HNH has constantly expanded its core collection and designed various additional lines. One thing that was to be expected is that all collections exclusively consist of flat metal frames. The screw-less hinges are another nod to innovative tradition, although HAFFMANS & NEUMEISTER took it upon themselves to create their own iterations. For autumn 2018, the label has already announced a new patented hinge concept, which will figure front and center of the Ultralight collection. SPECTR caught up with the three founders at HNH’s Berlin office to get the inside story behind their innovative offering. In the process, we not only learned exclusive secrets about the HNH brand universe, but embarked on a 100-year journey through the history of eyewear design. 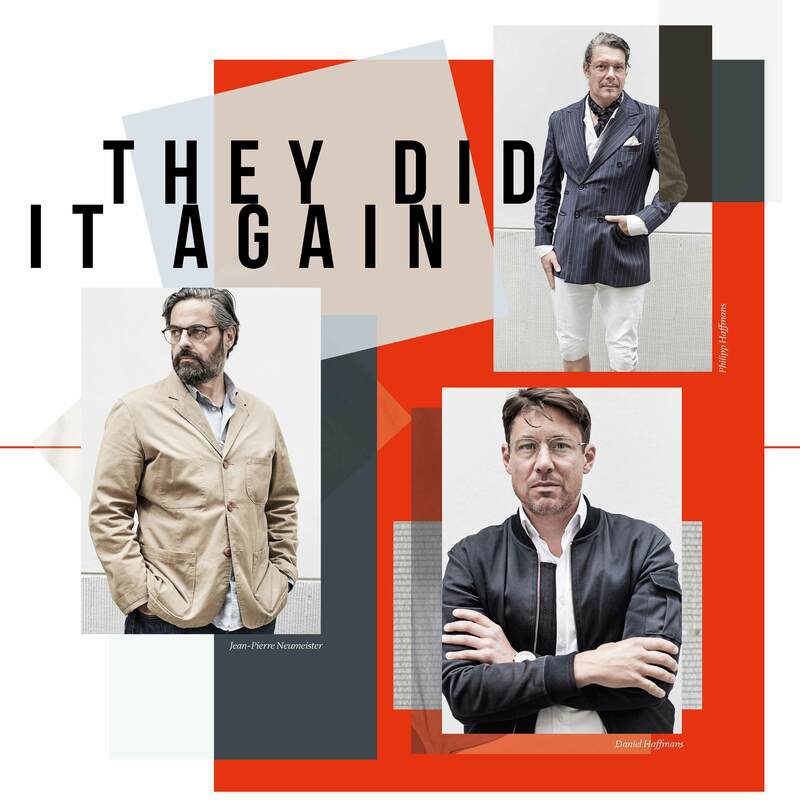 Philipp, Daniel, and Jean-Pierre, you guys left Mykita two years ago, although it was you who founded and built up the brand. What happened? Daniel: Outsiders tend to only see the perfect facade of a company and not necessarily the inter-personal connections behind it. So when a company and a brand are successful, nobody can imagine why anyone would want to give that up. But three years ago we had just arrived at the right point in time to call it quits and start something new. Previously, you were also co-founders of ic! 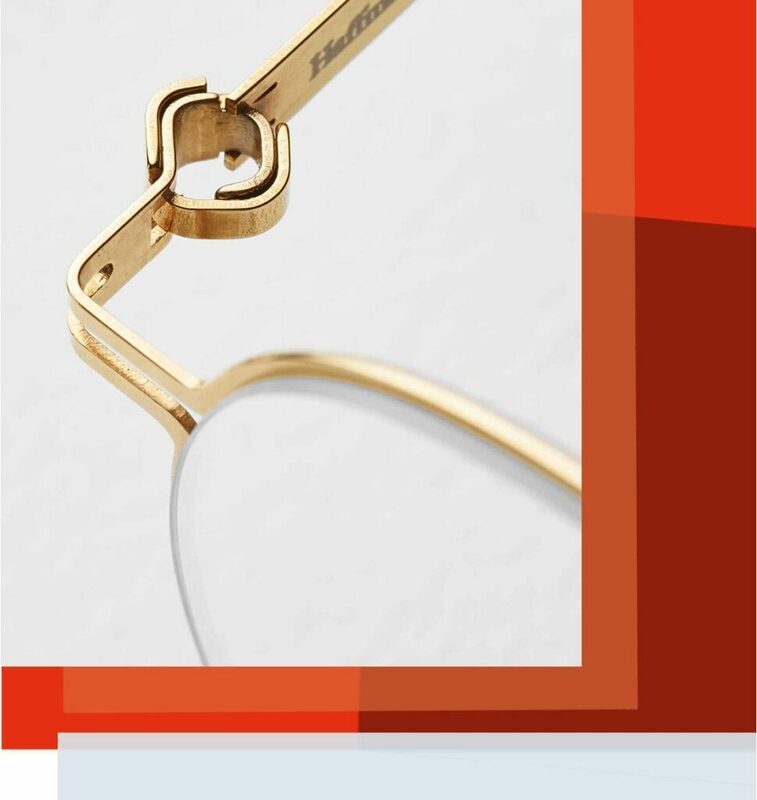 Berlin, so the launch of HAFFMANS & NEUMEISTER marks your third eyewear label. Have you ever entertained the idea of pursuing something entirely different? Philipp: We all had different ideas at the time. Jean-Pierre already had an arts gallery, Daniel wanted to get back into architecture and I had plans to pursue apparel. But after a short time we all realized that we actually miss eyewear. And that’s when we also knew that our story in the eyewear world was far from over. Daniel: Our shared history of over 20 years as the inventors of the flat metal frame as well as founders and designers of ic! berlin and Mykita really had a profound impact on us. We realized that eyewear is dear to our hearts and that we have a lot of fun doing it. Additionally, we have all developed intense friendships with other companies and our customers, which we also treasure. So we can rightfully say that HAFFMANS & NEUMEISTER allows us to build upon our tradition in avant-garde eyewear. So building image-heavy eyewear brands is your passion? Daniel: The brand aspect is at the center of many companies, while the product ultimately becomes replaceable. We come into it from the product side of things, whether it’s about the glasses, corporate identity, tradeshow booths or our own stores. We develop everything meticulously with a love for detail. That’s a unique approach and our customers have always sensed that we are serious about what we do. Both at ic! berlin and Mykita, our success has proven this to be the right direction. But you are also aware that the bar is set pretty high after the success of both your previous labels? Jean-Pierre: The level of expectations is indeed rather high. Everybody expects to see something that’s never been done. So in reality, we have actually become a competitor of our own products. For us it’s actually more about advancing our ideas with HAFFMANS & NEUMEISTER and taking it to the next level. How can we imagine this next level? With totally new concepts? Philipp: We believe that a focus on our core competencies is the key to success. As the inventors of the “flat metal eyewear” category, we want to focus HAFFMANS & NEUMEISTER on our 20-year expertise and passion for sheet metal – with the goal of pushing this product segment forward. The trend on the eyewear market is currently headed towards every company trying to do everything, which ultimately leads to brands becoming interchangeable. Daniel: Metal frames still create a high-value impression that cannot be matched. They are super lightweight and highly adaptable. For us it’s the logical continuation of our own story to keep working on it. But even when we entered the market with Mykita in 2004, many people called it an imitation of ic! berlin. But there were also those who could see the creators and inventors of the flat metal frame behind the brand. They were the ones who decided to bring the new products into their store and it has worked well for them until today. With HAFFMANS & NEUMEISTER, are you trying to achieve a clear delineation to previous brands in terms of the visual appearance of the products? Daniel: Both previous brands are of course highly characterized by our signature style, which has remained constant over 20 years at different companies. We want to stay true to this success formula with HAFFMANS & NEUMEISTER as well and will not try to force it into an entirely different direction. But then again, the new brand does stand out from past offerings, because HNH has a more mature and upscale appearance. How do you achieve this positioning? Philipp: We want to make the brand warmer, more personal and high-quality. This already becomes apparent in the choice of our CI color, a warm chestnut tone. For Silmo 2017, we introduced a meticulously crafted collection that is the foundation for our product offering, and the basis for future expansions. Next to finely crafted designs, we have also enhanced the functional features of our products. The results include a new hinge that looks far less technical and creates a more elegant and intuitive impression. The basic collection pays homage to classic spectacle shapes. What made you decide to incorporate your own names into your brand for the first time? Jean-Pierre: With ic! berlin the focus was on the name of the city, with Mykita about the location of the company. With HAFFMANS & NEUMEISTER it’s about the people behind the products who contribute their 20-year experience into the company. The focus is getting increasingly precise, in line with our strategy to explore the “flat metal” segment in depth. More about that later. What is the brand philosophy behind HAFFMANS & NEUMEISTER? Philipp: For us it’s essential that a technical product also looks beautiful. Something technical can simultaneously be functional and visually appealing. We are only content when both factors complement each other. We also strive to pursue new ways of thinking with each product, away from the beaten path. Will you also continue the focus on technical quality “Made in Berlin” with HAFFMANS & NEUMEISTER? Jean-Pierre: Berlin is our home, we all have family roots here. Even after 20 years, Berlin remains a totally exciting and bustling town with endless possibilities. What’s more, we have rebuilt our own manufacturing workshop in Berlin. Our entire product development process has become far shorter and simplified through our in-house production. We have better opportunities to control the quality, processes, and delivery timeframes as well as reducing our speed to market. We are looking at the first HNH collection in front of us and – to no surprise – we are seeing sheet metal frames. Philipp: The term “sheet metal frame” does not live up to the product and its value proposition. The glasses are indeed crafted from stainless steel sheets, because the material is fantastically suited for eyewear manufacturing – which is something we put into action for the first time 20 years ago. The term “flat metal” is more suited to the quality of the products in our opinion. Why do you like flat metal so much? Daniel: Frames created from flat metal have an exceptionally high value because they are light as a feather and highly moldable. At the same time, they have a very graphic appearance and a jewelry-like character. We are seeing tremendous future potential in this material. It allows us to work very precisely and leaves us much room for creative designs in its three-dimensional form. How do you achieve this three-dimensional impression? Daniel: In close alignment to the origami principle, the folding of the material is the fundamental function behind our frames. Whenever you bend paper, its static properties change automatically, allowing you to create highly stable objects. We want to expand on this rather simple but highly effective method. Folding raw materials is a constant theme throughout disciplines such as product design and architecture. This conceptual approach has also led to our very first screw-less eyewear hinge. 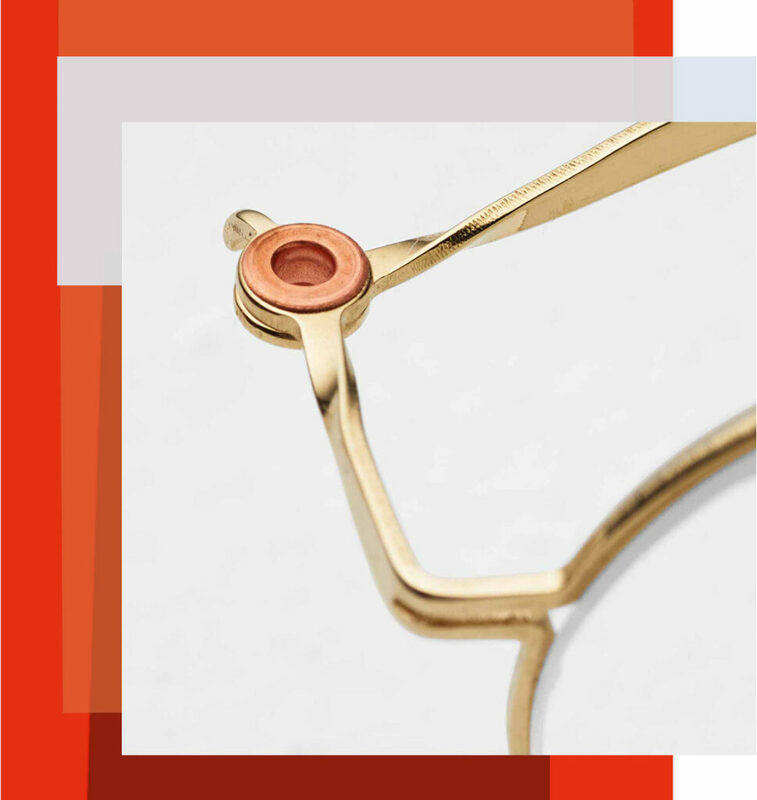 Today, “screw-less” has become a staple design feature in eyewear that many products like to claim. It’s indispensable in the eyewear universe – and we have created this concept. The hinges in your latest collection also function entirely without screws. What’s new this time? Daniel: Following our brand strategy, we wanted our hinges to be more high-grade and at the same time reflective of our expertise in flat metal. As a result, we have a minimalistic screw-less hinge, in which two squares intersect and can be intertwined at a 90-degree angle. This allows the temple to arrest precisely and notably in the opened and closed position. The hinge looks far less technical and creates a harmonious form language while being understated from a visual standpoint. Will your collection remain limited to flat metal? Jean-Pierre: We are not ruling out other materials, but initially want to maintain the focus of HAFFMANS & NEUMEISTER on further developing metal frames. Our collections will differ significantly from each other, so our product offering will be sufficiently broad. From flat metal to wire – HNH plays with the course from surface to line. All the product details you mentioned are part of the Line Collection. What’s the story behind it? 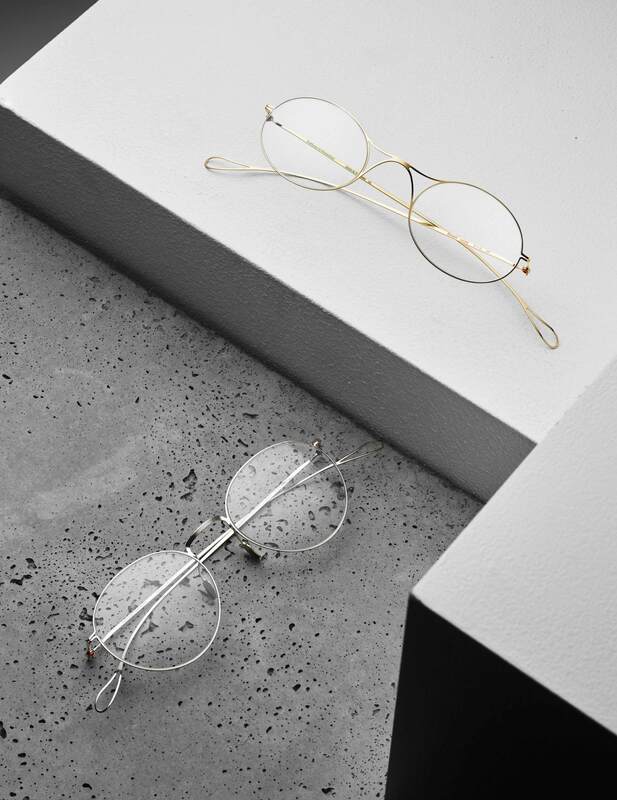 Philipp: The Line Collection is the very first HNH collection and pays homage to the classic, established shapes of the early days of eyewear design all the way into the present. It serves as our basic collection which we will continuously expand. The color spectrum of our frames is defined by gold, rosé gold, silver and black, in some cases supplemented by colorful accents in composite parts crafted from acetate. Would you describe this collection as a journey through the last century of eyewear design? Philipp: The collection is the result of a rigid design concept, which is oriented on the fundamental forms of eyewear frames in a historic context. There are six essential types: round, oval, panto, aviator, cat eye and American square. They form the basis of all eyewear frames that exist today and also the foundation of our new collection. So it’s a collection full of retro styles? Philipp: No! 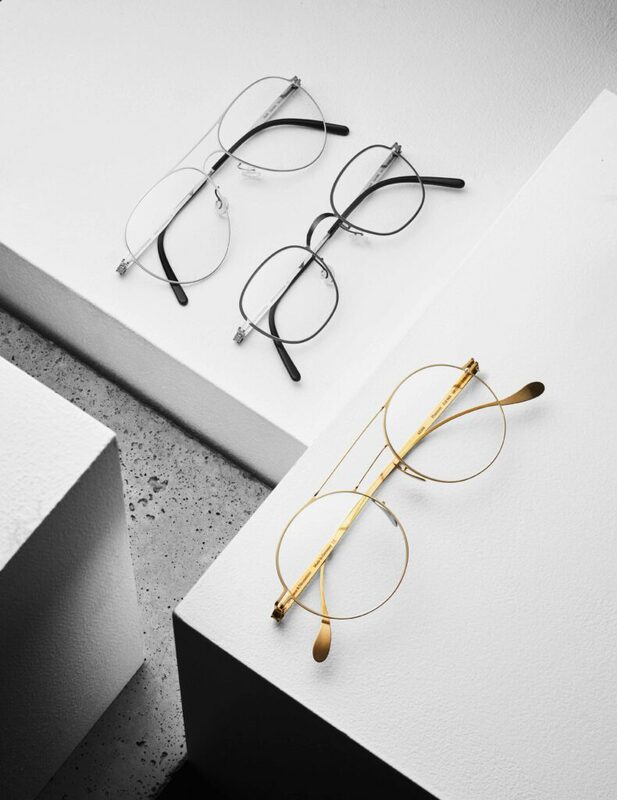 Our goal was to bring to market a highly curated and balanced collection with a broad range of sizes in which opticians can find everything they need to work with and drive sales. We have gone into great detail to elaborate on the silhouettes of each type and place them in a contemporary context. Just the mere translation of shapes into the language of flat metal is a high level of abstraction that differentiates the products from traditionally crafted eyewear and sets them in a contemporary light. In short, the collection carries a strong HAFFMANS & NEUMEISTER signature. What is the collection’s ratio between prescription models and sunglasses? Jean-Pierre: For the first time we will be offering the majority of our frames as both prescription and sunglasses models. Many of our RX-frames are highly suited as sunglasses, but the entire look of the frames changes dramatically when fitted with tinted lenses. The only exception are frames that are unsuitable as RX-frames due to their size factor. Will you keep the amount of models in the collection manageable? Jean-Pierre: The Line Collection currently consists of 23 models in four colors each, which is quite a lot at launch. But we are also planning an additional collection in order to offer a broader portfolio. At this point, your journey through time seems to end in the 1960s. Why? Jean-Pierre: Next to our two current collections, Line and Phasmid, we are also bringing to market two additional collections, which includes the P60 Collection focused on exactly this point in time. P60 is short for Post ‘60s so we cover everything that transpired after the 1960s period. Philipp: The Line Collection captures the form language of the “first wave” of eyewear types. The P60 Collection, which is now coming to market, is all about the aesthetic evolution of eywear after the 1968 revolution. It’s an experimental era in which classic eyewear shapes changed radically, a true explosion of shapes. They suddenly became rather large, colorful and expressive. 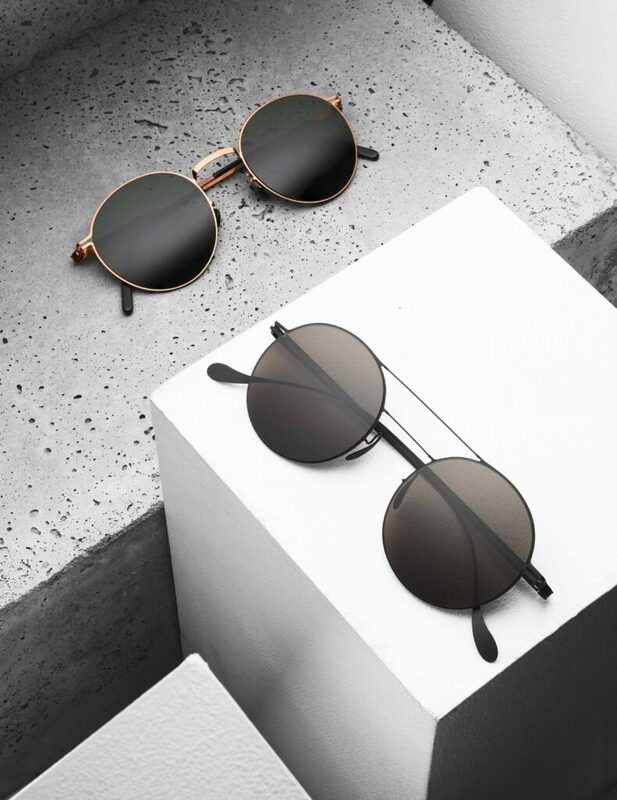 Blends between classic types led to new and interesting eyewear shapes. That is the spirit of the P60 Collection as it creates new shapes in a contemporary context. Philipp: Yes, we have a nice innovation lined up – the Ultralight collection – a very filigree and discreet collection. What exactly are the standout characteristics? Jean-Pierre: The execution of the new collection is a play on the transition from surfaces to lines, from flat metal to wires. The cut-out of the frame is so narrow in some places that an almost square cross-section is formed. The slender frame cross-sections thus almost resemble those of wire frames in some areas. Will there also be a new hinge concept? Daniel: Yes, the continuous minimization of the material only works to a certain extend with an existing hinge solution. At some point you are no longer able to match the hinge with the specific elements of the frames from a technical and proportions standpoint. That’s why we created a new hinge solution that is highly suited towards the lightweight character of our new collection. On that note, we are also seeing four rather extravagant glasses on the table in front of us. Philipp: You’re looking at the previously mentioned Phasmid Collection. It represents a sense of creative freedom outside pre-established conventions. For instance, the elimination of nose pads lends the design a rather graphic-driven, bold look because the lines remain undisturbed by this kind of add-on. It’s an aesthetic feature on one hand, and another experimental take on minimalism on the other, which is part of the design philosophy here at HNH. Our target group consists of opticians and high-end boutiques as well as concept and designer stores. Where will your “regular” collections be available? Jean-Pierre: At select high-end opticians. Have you considered a distribution concept extending all the way to end consumers? Daniel: Of course we have considered it, but have opted against taking this step at this point. Our business concept is entirely different. We are really banking on the customer service capabilities of our opticians to communicate the special aesthetic and manufacturing quality of our collections. So for you the cooperation with established opticians still presents a future-proof concept? Daniel: The market has seen continuous differentiation over the past ten years. The last years saw the rise of brands that are exclusively conducting business in the B2C online retail space as well as their own retail stores. For established opticians and labels, these professionally positioned companies with their low price points are posing a challenge. Some of our clients are now eliminating their medium price segment entirely for this reason and place their focus exclusively on the higher price, premium eyewear category. So there is still future potential for established opticians and we want to raise the bar with them. Are opticians showing appreciation for HAFFMANS & NEUMEISTER? How has the response to the new collections been so far? Philipp: Many opticians are happy to see that we’re back with a new brand and that our expertise is not lost to the eyewear market. So for this reason we already have quite an established customer base. At the same time, opticians must also be able to understand the differences to our previous labels and educate their customers accordingly. We hope that they will help to see HAFFMANS & NEUMEISTER off to a great start.